Download the following script: OrdersAndData.sql. Figure C.1. ERD for Orders and Data. 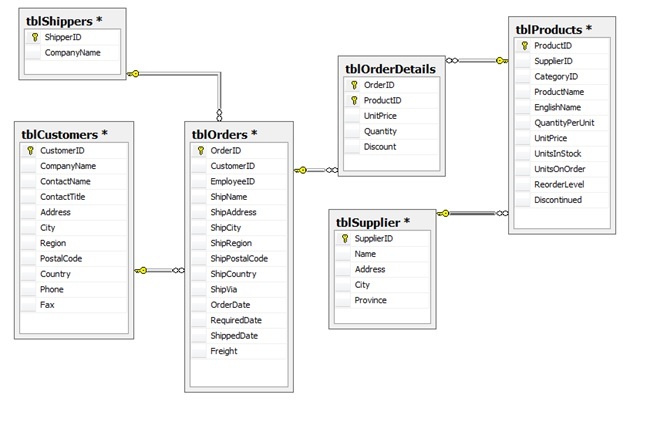 Use the script OrdersAndData.sql that creates the tables and adds the data for the Orders and Data ERD in Figure C.1. Create a database called Orders. Modify the script to integrate the PK and referential integrity. Show the CREATE TABLE statements with the modifications including the constraints given in step 3.
tblShippers: CompanyName must be unique. tblOrders: ShippedDate must be greater than order date. 1. Show a list of customers and the orders they generated during 2014. Display customer ID, order ID, order date and date ordered. 2. Using the ALTER TABLE statement, add a new field (Active) in the tblcustomer. Default it to True. 3. Show all orders purchased before September 1, 2012. Display company name, date ordered and total amount of order (include freight). 4. Show all orders that have been shipped via Federal Shipping. Display OrderID, ShipName, ShipAddress and CustomerID. 5. Show all customers who have not made purchases in 2011. 6. Show all products that have never been ordered. 7. Show OrderIDs for customers who reside in London. Use a subquery. Display CustomerID, CustomerName and OrderID. 8. Show products supplied by Supplier A and Supplier B. Display product name and supplier name. 9. Show all products that come in boxes. Display product name and QuantityPerUnit. 1. Create an Employee table. The primary key should be EmployeeID (autonumber). Add the following fields: LastName, FirstName, Address, City, Province, Postalcode, Phone, Salary. Show the CREATE TABLE statement and the INSERT statements for the five employees. Join the employee table to the tblOrders. Show the script for creating the table, setting constraints and adding employees. 2. Add a field to tblOrders called TotalSales. Show DDL – ALTER TABLE statement. 3. Using the UPDATE statement, add the total sale for each order based on the order details table. Appendix C SQL Lab with Solution by Adrienne Watt and Nelson Eng is licensed under a Creative Commons Attribution 4.0 International License, except where otherwise noted.